As details of the terrific shooting in Newtown, Connecticut began to surface on the news last Friday, I began to feel angry. While I was and still am deeply saddened and grieved for everything that has happened, I’m also angry. I’m angry at the assailant for killing all of these people. However, I’m also angry at society for the problem of violence we all own together. It’s not just the mass shootings and other acts of murder that happen every day. Violence is all around us and in many ways it’s glorified and even justified when we convince ourselves that it serves a noble end. Even in the holiday season when we are to be of good will and cheer, it has become routine to hear of people getting trampled and assaulted during a Christmas “Black Friday” shopping frenzy (that now begins on Thanksgiving). So I’m angry because violence has in many ways become our way of life. What I want to know is why are we so violent? Yet this seems to be a question that people want to evade. When mass shootings happen the conversation quickly turns political as some people begin talking about the need for more gun control in America, as though stricter gun laws will curb the violence. Those opposed to more gun-control measure seem to respond by suggesting that a few more well-armed citizens would prevent such murderous rampages from happening. But neither sides gets it: the problem of violence is neither the lack of gun control nor the lack of well-armed citizens! 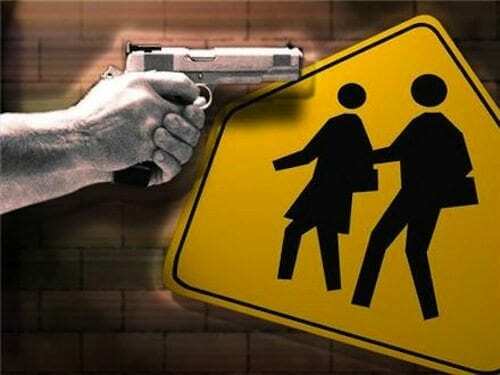 So while the question of more regulations on the use and ownership of guns or on the establishment of more armed security officers in public schools may be necessary, it is a question that evades the bigger and deeper issue. So let me explain a bit more. When I was in college I worked for a addiction treatment facility that served teenage boys and one of the underlying beliefs of the treatment center was that drugs and alcohol were not the problem, they were a symptom of the problem. So get to the real issue and address that problem. That makes sense and I believe it makes sense with violence as well. Violence is only the surface problem which is, in fact, just symptomatic of the bigger and deeper issue. This larger issue is neither social, psychological, nor political, though it impacts everyone of those arenas. The underlying issue that is at the heart of our violence is a spiritual issue. I don’t believe it is coincidental that after the first recorded sin of Adam and Eve, the very next story we read of in the Bible is the story of Cain killing his brother Able. There is something about sin that allows us to justify all sorts of actions, including even killing our brothers (and sisters). You and I may never personally fire a gun and kill someone but that something that drives some to kill is also what drives others, like ourselves, to commit other unjust and unrighteous or immoral and unethical deeds… sin. The something I am speaking about is what the Bible calls sin. When the rule of God is denied, which is exactly what Adam and Eve did, we become self-serving. That self-serving philosophy is as nearly as old as humanity and it is why people, either as individuals or as nations and tribes, will trample upon others and even kill if necessary. Until we deal with this self-serving spiritual-sin issue that is championed in America by our values of consumerism and American individualism (or the American dream), we will continue to plunge into an abyss of moral depravity that is expressed in violence as well as many other terrific and unfortunate maladies – including the suffering of innocent people. As an unapologetic believer in Jesus Christ, I believe Jesus is our only hope from this problem we face. However, I don’t believe Jesus comes to save us only from the consequence of sin (death). I believe Jesus also comes to save us from sin itself by teaching us how to live a selfless life in which we love God and neighbor as humble servants of good deeds. Maybe it is time we give Jesus another hearing…and that includes us Christians too, who also seem more and more apprehensive about actually following Jesus as a way of life. Come, Lord Jesus! We need you more than ever! Here is the message I shared before the Columbia Church of Christ on Sunday, December 16th titled “Get Serious About Jesus” and from Hebrews 3:1-6. It really speaks to why Jesus has come (Advent) in light of the tragedy in Connecticut and the larger spiritual problem of violence that grips our society. It is 20 minutes in length if you would like to listen.